The first indication that the Trenton Thunder would be presenting much more than a minor-league baseball game on the evening of July 28 was evident before fans even reached for their tickets. More than an hour before the game, in front of Waterfront Park in Trenton, a group of energetic young men and women were singing Israeli songs, dancing for the crowds. 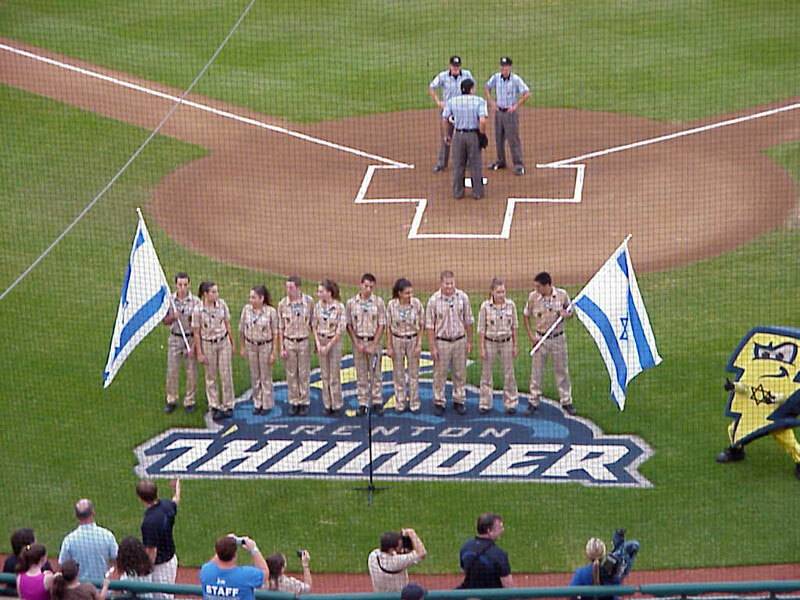 The performers were a troupe of Tzofim, Israeli Scouts, and the occasion was the Thunder’s fourth annual Jewish Heritage Night. The Israelis reconvened later behind home plate to sing “Hatikva,” followed by “The Star-Spangled Banner” performed by the father-daughter duo of Pat and Marisa Giblin. Pat is on the staff at the JCC of Princeton Mercer Bucks’ summer camp, where Marisa is a camper. By game time, many of those in attendance — Jewish and non-Jewish fans alike — had visited the Gary and Lenny’s New York Deli stand, whose menu included pastrami sandwiches, Coney Island knishes, and, of course, kosher hot dogs. The Lawrenceville delicatessen had distributed game tickets to youngsters in the community, area clergy, and other guests. Both the JCC and the Thunder arranged for a host of Jewish groups to attend the game, among them contingents from Beth El Synagogue in East Windsor; Congregation Brothers of Israel in Newtown, Pa.; and Congregation Beth El of Bucks County, Congregation Kol Emet, and Knesset HaSefer, all in Yardley, Pa. The JCC of PMB also had a sizable delegation. 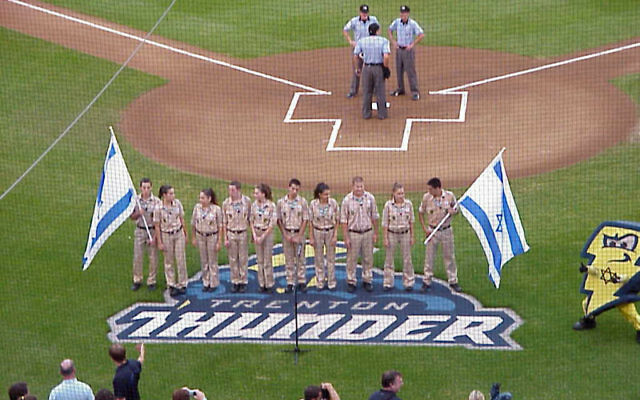 Throughout the game, the Thunder offered Jewish and baseball-themed trivia. Even Boomer, the team mascot, had his name spelled out in Hebrew letters on the back of his jersey. The game itself? The Richmond Flying Squirrels, an affiliate of the San Francisco Giants, defeated the Thunder, the minor league team affiliated with the NY Yankees, 8-3. No matter. The defeat didn’t seem to bother those who were on hand to celebrate Jewish Heritage Night. “I’d never been here before, and I must say it’s a magnificent place,” said Cantor David Wisnia, who was at the game with his son, Rabbi Eric Wisnia. Gary Schindler and Leonard Punia, proprietors of the NY Deli, played a significant role in the festivities. Schindler, in fact, spent a large chunk of the evening serving customers at the deli’s stand. “Gary was nice enough to allow me to kasher the grill,” said Rabbi Menachem Segal of Knesset HaSefer, as Schindler handed a few dogs to a customer wearing a kipa.